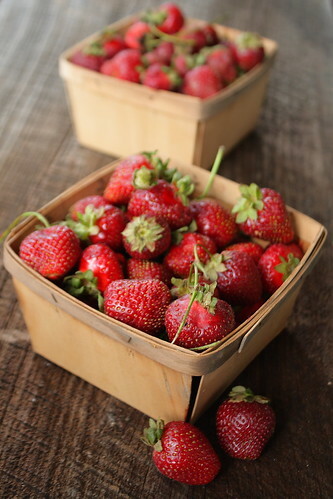 Strawberry season was a glorious one this year, starting early and lasting a long time. 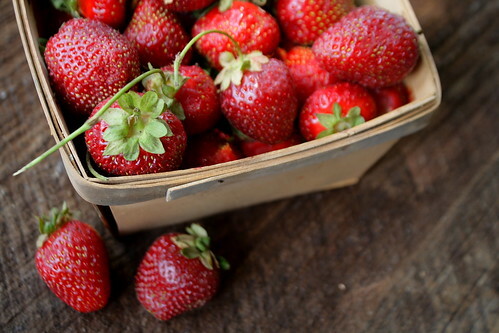 From the very first quart of local strawberries I saw – or rather smelled – in early May, I vowed to savor them more than ever. Somehow that sweet ripe fragrance got in my nose and stayed there, keeping the craving constant for these morsels of juicy ruby heaven. I never did get my fill, even after more than a dozen quarts! 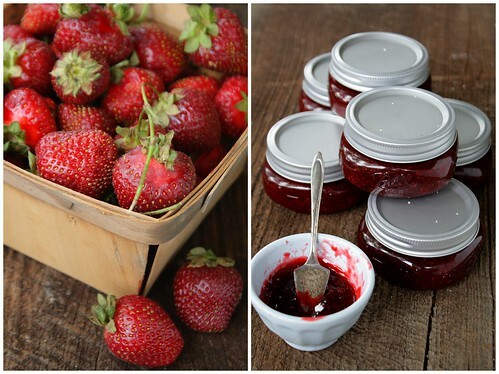 In any case, to send off strawberry season in style, I made a luscious batch of jam scented with a vanilla bean and cooked to a perfect consistency. 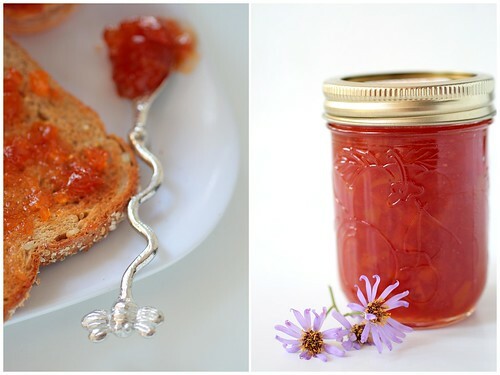 Jam making really is quite easy, especially when you have a simple recipe that doesn’t require that dreaded pack of pectin that never seems to be on city store shelves. 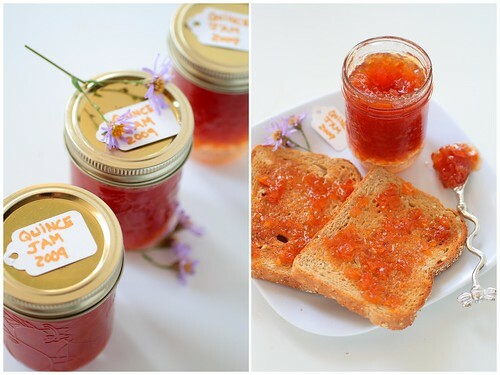 If you haven’t tried making your own homemade jam or jelly before (by the way, jam in chunky, jelly is strained to be smooth), this is the perfect one to try since it’s really very simple. 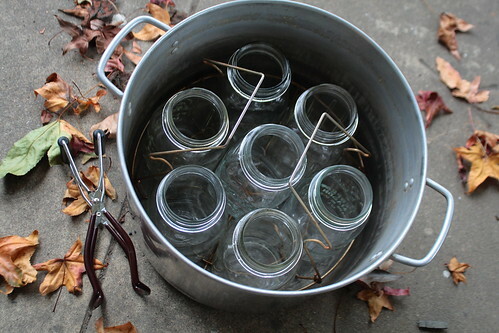 The only trick to making sure the jam thickens is to let it boil vigorously, which means you’ll be needing a very large pot to keep it from spilling over and making a mess of your stove. Slathered on a fresh thick slice of bread from a loaf given to me by another farmers market vendor, I decided strawberry season wasn’t really ending after all. This jam is so full of fresh berry flavor, I’ll feel like I’m eating a ripe strawberry when I crack open a jar in December. Well, I don’ t know about where you are, but here it’s proving to be the perfect weekend to tuck in and get some things done around the house because, well, there’s really no other choice. 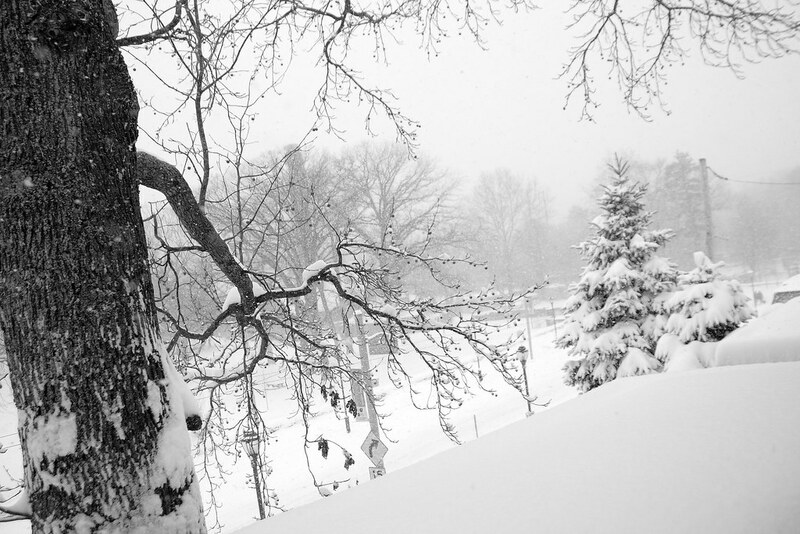 In my humble opinion, a couple dozen inches of snow are a wonderful excuse to be a little lazy and perhaps a little bit productive too as your mood suits you throughout the day. Cups of tea and bowls of soup are also necessary amenities for snow days, and I’ve had plenty of both. But while the rest of the city was running rabid to the store last night, desperately nabbing food to get them through the weekend of snow drifts, I was able to just walk down the steps to my basement and look over my shelves of preserved goodies that have been such a treat over this entire winter: pears, peaches, beans, jams, and pickled beets. 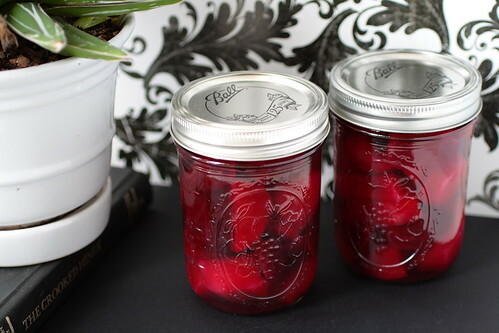 That’s right…pickled beets. Ever had such a thing? I suspect pickled beets are a culinary colloquialism, part of my Pennsylvania Dutch heritage, but I could be wrong. All I really know is that I love them, though that wasn’t always the case. 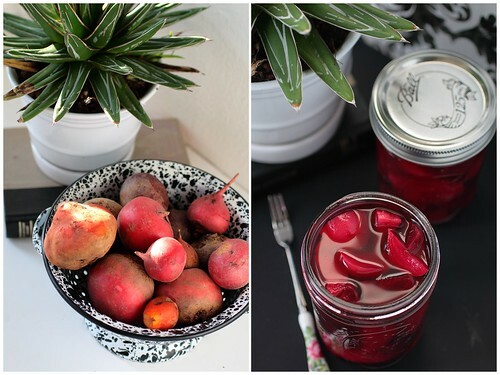 When I was a girl, my mom would make large batches of jars full of bright pink chunks of pickled beets, and it was my job to cart them down the narrow stairs to our root cellar to fill the cupboards there. I’m not sure if it was resentment for all the lugging or just the underdeveloped tastes of a kid, but pickled beets equaled “yuck!” in my young mind. 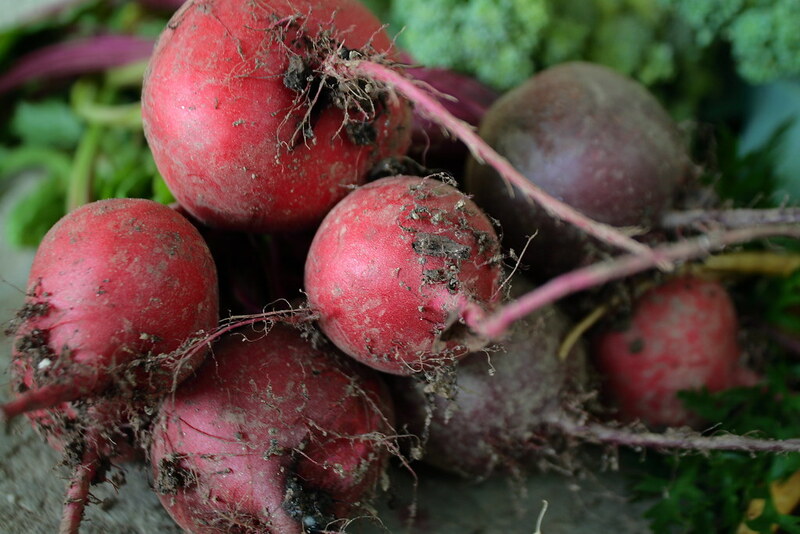 Oddly enough, I don’t think we ever ate fresh beets, roasted or otherwise, when I was growing up. 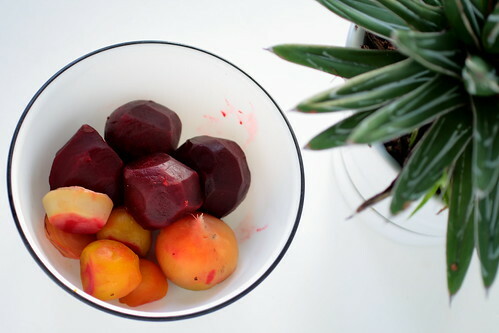 Somewhere along the way, I got over my foolish hang-up about pickled beets and grew to appreciate them for what they are: a delicious sweet and savory treat that, when eaten in a snow storm, reminds me of the sunny autumn days when I plucked those very same beets out of the warm fragrant earth. In a few months, all this snow will have been melted away and it will be time to plant more beets again. 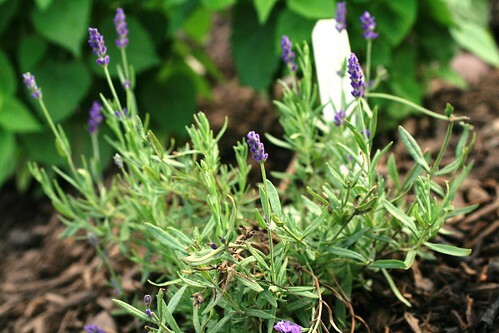 They make a perfect spring crop to put in your garden as soon as you can get out there and start scratching out some rows. 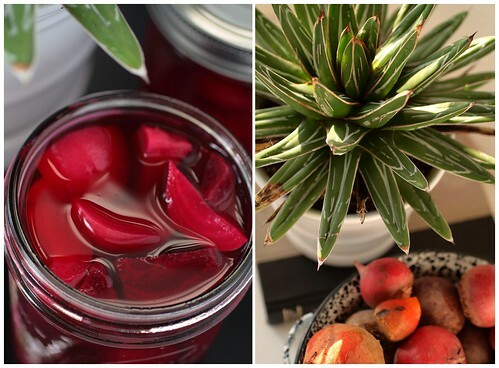 Be sure to buy plenty of seed so you’ll have enough for a second crop in the fall to make jars full of jewel-toned pickles of your own for next winter. Here’s a quick and dirty little post on how to make your own pumpkin puree to freeze and use throughout the winter. I happen to be using the large crop of butternut squash that I harvested from my garden to make the batch of puree I photographed for this post, but you can use any type of eating pumpkin. Butternut squash, by the way, make a great substitute for pumpkins (really, you’ll never be able to tell the difference in the final dish) and are usually available much longer in the season, both earlier and later, than pumpkins. I find it’s best to go at the puree-making process in big batches as it is a bit time-consuming and messy whether you’re making a little or a lot so you might as well make a lot, right? But the effort is worth it as fresh pumpkin puree is notably different from the canned stuff you’ll get at the store. 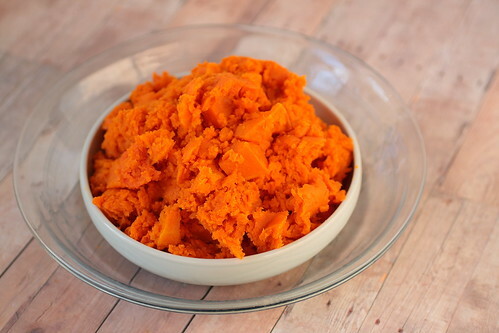 The puree is much more vibrant in color, contains a lot more “juice” that adds moisture to your dish, and retains all the amazing vitamins that pumpkin has. Did you know pumpkins are rich in vitamin A, potassium, and fiber? The addition of pumpkin to just about any dish can be considered a very healthy one indeed. This pumpkin puree can be used in pumpkin rolls, pies, smoothies, ice cream, truffles, bread puddings, risotto, soup, sauces… once it’s in your freezer, you can let you mind go free to dream up all the possibilities. Tonight I’m watching the first snow of the year flutter in damp fat flakes past the street lamp outside my front window. Oh, hey, look! 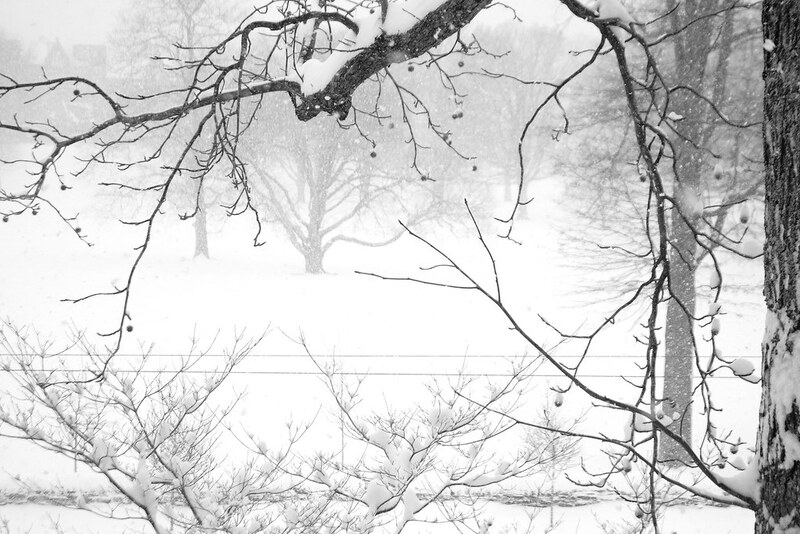 It’s snowing on the blog here too. Fun, huh? 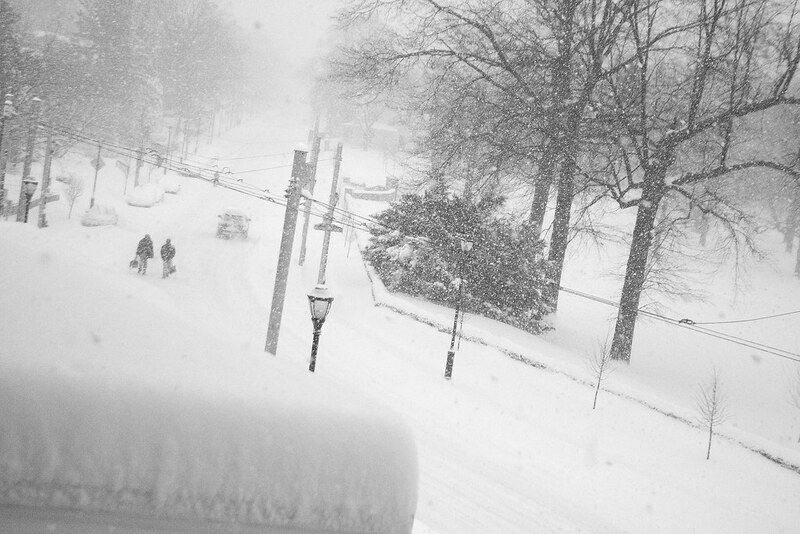 Winter is finally at our doorstep. 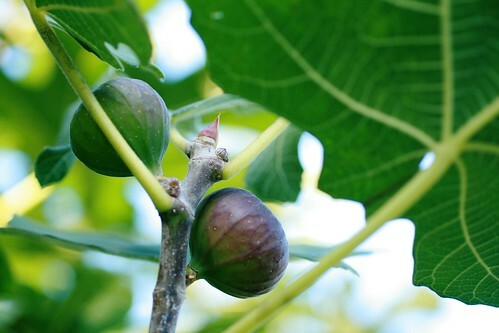 Seasonal local eating will become a bit of a challenge over the next five months. But that’s where the beauty of putting up jars of this and that and stockpiling root vegetables and winter squash comes in. 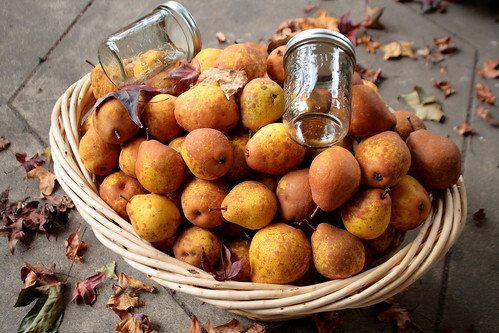 One bunch of jars I put up in my cupboard earlier this autumn was of beautiful golden Quince Jam. This project, my first time working with quince, was a very special one for me. 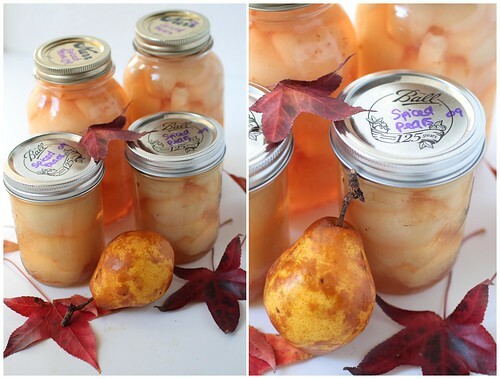 Just as with the Pickled Pears last year, mastering quince jam was something I wanted to do for my grandmother. 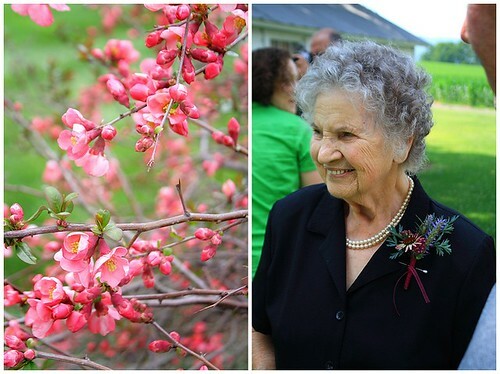 The mere mention of quince brings this amazing sparkle to my 90 year old grandmother’s eyes. 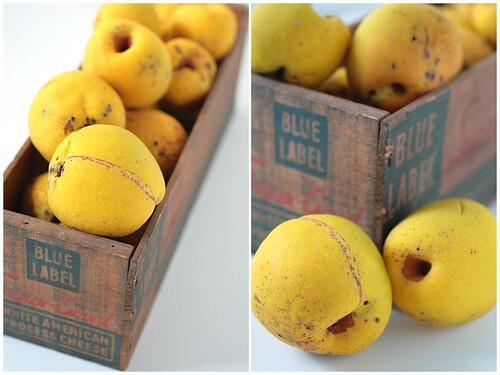 She remembers eating it as a child when aged quince trees were still commonly found in the backyards of most farmhouses. Quince trees are no longer all that common, at least not where I live. In fact, I had never laid eyes on a quince until last autumn when I saw some while working at Longwood Gardens. At that time, I wasn’t smart enough to realize I had the perfect opportunity right before me to make a very special gift for my grandmother. Of course, this autumn, when the quince ripened and became fragrant (though they stay rock hard even when ripe) in October, I made sure to grab a bag and go harvest a bunch from that very same tree. Now, a quick technical discussion on quince might be helpful. There are actually two different main categories of quince out there: the kind grown for its fruit crop (Cydonia oblonga) and the kind grown for its breathtaking flowers in the very early spring (Chaenomeles speciosa). The flowers of the former one are so-so and the fruit of the latter is, well, so-so, as I discovered. Don’t get me wrong, I’d pick the Chaenomeles (flowering quince) over the Cydonia any day because the fruit is still very tasty, just more of a pain to work with since it’s much smaller and not as prolific as the quince bred for eating. With the flowering quince, you get both a beautiful ornamental plant and a delicious edible harvest. 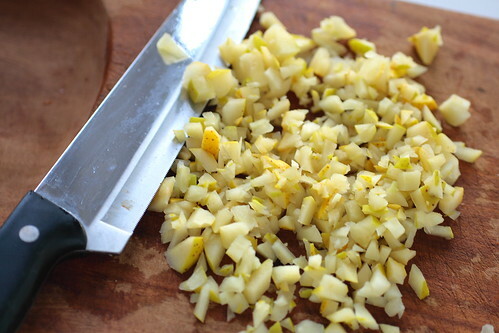 For this recipe, I used the Chaenomeles, but most quince recipes are calling for the Cydonia so be aware of that if the recipe you are using calls for a certain number of quince…Cydonia fruit is much larger than Chaenomeles fruit. Back to the fun stuff. This jam is really unique and I now understand why my grandmother giggles at the memory of it. The quince has an unmistakable texture – a crunch even after extensive stewing – and a very bright tingly flavor that is unlike any other fruit I’ve tasted. By the way, you really shouldn’t eat quince raw. You might break a tooth for starters and the flavor of a raw quince is apparently very astringent. 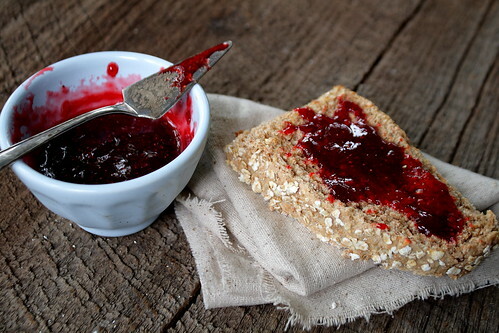 I absolutely fell in love with having this jam over a warm slice of multi-grain toast. 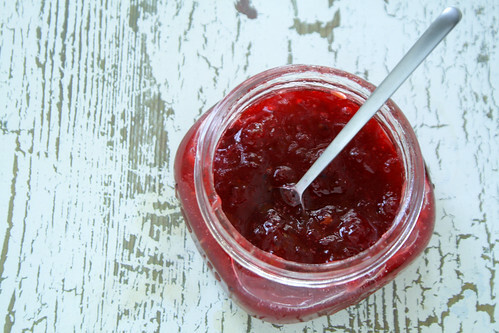 Unlike most jams, this one isn’t overly sweet and that, coupled with the chunky texture, makes it feel like something of substance rather than just another sugary breakfast spread. I really can’t wait to give a large jar of Quince Jam to my grandmother for Christmas later this month and watch the sparkle spring up in her eyes. We’ll have thick slices of toast and jam together and laugh at all the grandkids running around with their freshly unwrapped toys. What food gifts are you giving for the holidays this year? This is it, folks. This is the last recipe in the official Rhubarb Fest here on SFTF. Won’t you miss that glaring shade of pink font? There may be a few stragglers to come, but both my kitchen and my garden have moved on from the ephemeral spring beauty of rhubarb to the boisterous abundance of early summer. Now that my harvest basket is brimming daily with sugar snap peas, kohlrabi, beets, lettuces, radishes, broccoli and more, it’s tough to stay focused on one exclusive ingredient. Can you blame me? But celebrating rhubarb has been fun, hasn’t it? 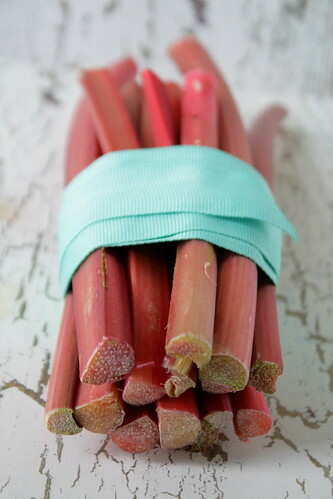 I discovered several new and delicious recipes, all of which astonishingly excluded strawberries, rhubarb’s bestest buddy ever! Of course I saved the best for last. 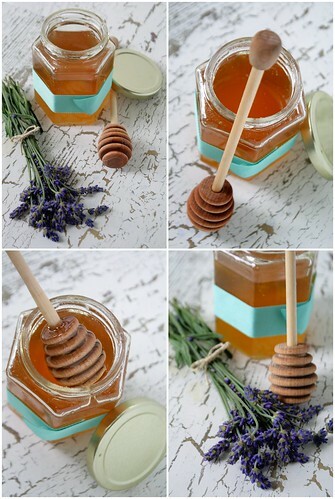 This batch of Rhubarb Lavender Jam combines so many of my favorite flavors: sassy rhubarb, floral lavender, and wildflower honey, all of which came out of my garden in one way or another. I also love that this jam does not require any pectin. It’s not that I mind pectin in my jam. I just mind the inevitable realization that I used up the last of my stash and never remembered to replace it (pectin’s tough to find in bulk here in the city so I buy mine at the little local store by my parents’ farm when I’m visiting). 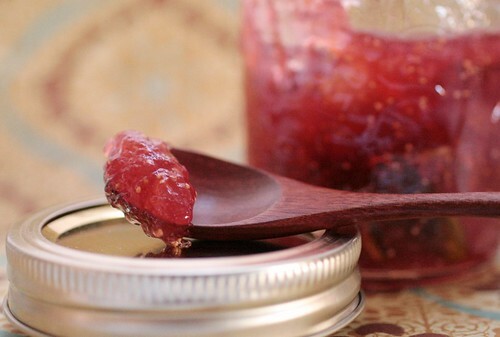 If you’re not a master jam maker – and I certainly don’t consider myself to be one like Tigress in a Jam, the creator of this recipe – this is an easy beginners batch. The ingredients take minimal processing and you can’t really mess it up as you can keep cooking it if you aren’t sure that its ready to set up. Rhubarb takes a licking and keeps on ticking like that. And this jam does indeed set up beautifully. I was looking at the top shelf of my cupboard just a minute ago and shaking my head in partial disbelief and partial smugness. On that top shelf is the oddest assortment of small batch jams and jellies I’ve ever had to date. 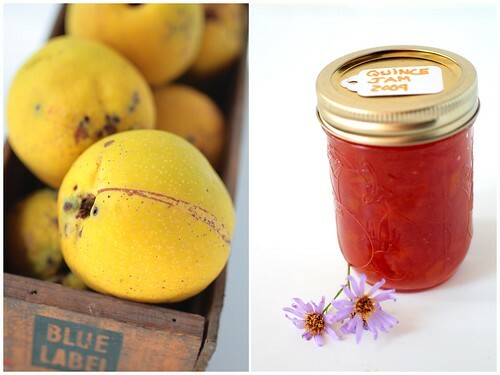 This growing season kept affording me opportunities to make these preserves that were just too good to pass up, and yet, now, I’m a bit shocked at what I have. Pity the fool that wishes to have something so commonplace as raspberry or grape jelly at my house. Still, all the recipes I tried and fiddled with this year for preserves proved very successful; thus my teeny bit of smugness. I have Ground Cherry Chamomile Jam, Apple Rhubarb Jam…and now Spiced Fig and Pear Preserves (jam really, but “preserves” sounded fancier). Originally, I really wanted to try the recipe my Portuguese pen pal sent me (thank you, A! 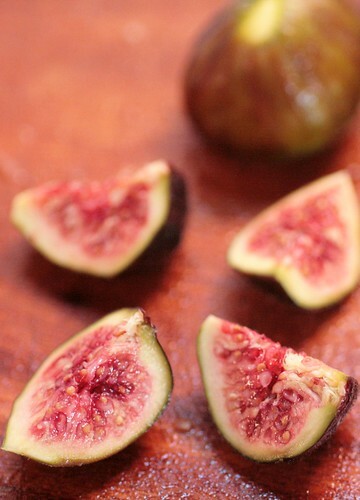 ), but alas my fig supply was severely dwindling by the time I got around to this jam-making session. I mulled it over and realized I had a lot of pears I’d plucked from the ancient pear tree at my childhood home. Thinking they would mingle well with the figs, I chopped them up and threw them in to bulk up my fruit pulp for this preserves project.